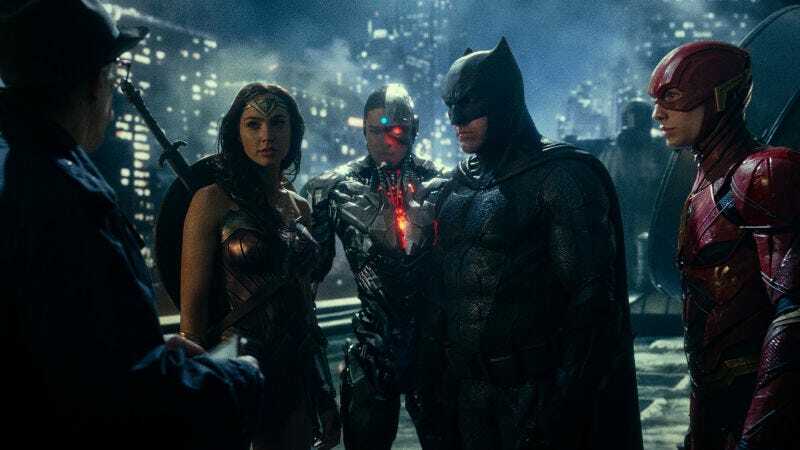 Having just weathered a news cycle that saw Hollywood execs attacking the movie review aggregation service for allegedly hurting box office receipts, Rotten Tomatoes has chosen a strange time withhold the score for this week’s Justice League. But that’s just what it’s doing—and no one is going to be happy. On Tuesday, Rotten Tomatoes informed the press that the score for the latest release from DC Films will not receive a Tomatometer score until 12:00am on Thursday, despite the fact that the film will hit many theaters tonight and critical embargoes will lift at 2:30am on Wednesday. So yes, you’ll be able to read various outlet’s reviews of Justice League, but you’ll either have to hunt them down one-by-one or go to a competing site like Metacritic to find an average score. The reason Rotten Tomatoes is doing this is to build up viewership for its new show See It / Skip It, which streams on Facebook. The delayed score will officially be revealed on the latest episode of the new show, and it will then go live on the website. See It / Skip It is kind of the Rotten Tomatoes version of Siskel and Ebert At the Movies. But instead of just featuring the opinions of two critics, the show’s commentators offer their own takes while mixing in general film discussion, taking comments from viewers, and ultimately revealing the Tomatometer score for the big releases of the week. For the show’s premiere on Facebook earlier this month, the aggregate score for Bad Mom’s Christmas was also delayed, so this isn’t entirely unprecedented. But the difference between the two releases is obviously enormous. Unlike the aforementioned Bad Moms sequel, Justice League is a heavily-promoted comic book movie from DC Films—which hasn’t had the greatest critical track record. Last year’s Batman v Superman: Dawn of Justice got just a 29 percent “fresh rating” from critics featured on Rotten Tomatoes. And DC’s Suicide Squad received a similarly dismal rating on the site, prompting thousands of fans to sign a petition demanding that the site be shut down. These kinds of overreactions aren’t just limited to the DC extended universe, either. In 2010, the contrarian critic Armond White inspired petitions to have his reviews removed from the service when he ruined the perfect score for Toy Story 3. These days you can still find White extolling the greatness of Adam Sandler movies on Rotten Tomatoes for all your hate-reading pleasure. Which is to say the site has maintained the integrity of its humble mission despite repeated attacks and attempts to shift the scales. Now a film that’s destined to incite a controversial reaction no matter what score it gets will have a little extra time at the box office before the critical consensus is published. What’s more, Justice League is being distributed by Warner Bros. Pictures, whose parent company owns a minority stake in Rotten Tomatoes. The majority of the site is owned by Fandango, which is a subsidiary of NBCUniversal, and both companies obviously have an interest in making sure box office sales are as high as possible. Critics are already suggesting that something rotten is going on here. Whether Rotten Tomatoes is seriously capitulating to Hollywood studios to give them a little buffer before the score is released on their big films or not, the optics aren’t great. And even if such a conspiracy were at play, it could backfire because casual moviegoers might wait until a handy score is available before going out to see the film. And what happens when the score finally does come out? Early buzz on Justice League seems to indicate that critical reactions will fall somewhere in the land of “meh, it’s pretty decent.” So the fans who froth at the mouth over these scores will still have plenty of material to fuel their rage. On top of all of this, Rotten Tomatoes has always positioned itself as an objective listing of outside critical opinions that isn’t making recommendations so much as collecting data, saying it even tries to eliminate subjectivity in its analysis of whether or not a review is positive. Speaking to The New York Times, Rotten Tomatoes vice president Jeff Voris cited Alien: Covenant as an example of a film in which the staff saw that a critic said it was a fresh rating but the review seemed negative. After double-checking with the critic, the rating was changed to rotten. Just launching a show with its own in-house critics giving their opinions about a film could harm the site’s reputation for objectivity. Voris said in a statement that the site’s goal for See It / Skip It is “engaging our social audience in a friendly debate.” Of course, the goal also appear to be the kind of pivot to video that social platforms and advertisers currently reward. Time will tell if this strategy hurts the trust that people place in Rotten Tomatoes. But if delaying the scores for tent-pole films becomes a regular pattern, it seems safe to say that Metacritic is a pretty great alternative.